Personally signed by the 2014 Queensland State of Origin Team, this rare piece of sporting memorabilia is framed and complete with a number of photos capturing defining moments from the 2014 State of Origin series and is set to be a collector’s item. The 2014 State of Origin series saw the Number 11 Jersey rested in honour of Arthur Beetson, the first Queensland captain of State of Origin at Game One in Brisbane. Game Two, played in Sydney, saw New South Wales take out the decider match, ending Queensland’s historic eight year streak. Back on home soil for Game Three in Brisbane, Queensland made a final dash to the finish line, dominating and taking out the win (32 – 8) for the final match of the 2014 State of Origin Series. 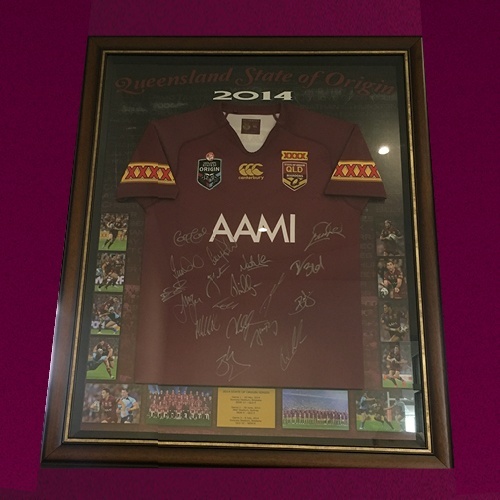 This limited edition framed memorabilia is personally signed by the 2014 Queensland State of Origin Team.